Netflix announced recently that it will start to block VNP and DNS proxy services soon that customers use to circumvent geo-restrictions set in place. The company, which operates in almost 200 countries now, is not the first to limit access to its offerings as companies such as Hulu have implemented similar measures already in the past. Netflix customers can use VPNs or DNS proxy services to access content made available to Netflix customers in different countries. This is done largely to access shows and movies that are not available in the residing country, but also by customers who are abroad and don't want to miss out on their daily Netflix binge. Netflix notes that customers will only be able to access content made available in the country they are in once the company has implemented measures to block unblockers. While Netflix sees itself as a global entertainment network, the reality is far less global and ultimately almost entirely local, especially if geo-restrictions are enforced by blocking the means to circumvent then. A Netflix customer from the UK has access to a different set of shows and movies than a customer from the US. And if you compare English to non-English speaking countries, the situation is even more dramatic than that. If you compare Netflix's offering in the US (almost 6000 TV shows and movies) with other countries, Denmark (2100), Poland (760) or South Korea (660), you will notice big disparities between them. Even English speaking countries such as Australia have far less shows (2092) than the US. Even though the offer is inferior in terms of show and movie availability, customers from these countries pay the same monthly subscription fee that customers from the US are paying. Netflix appears to be aware of that, stating that it is looking forward to "offering all of our content everywhere and to consumers being able to enjoy all of Netflix without using a proxy". It is unclear how Netflix plans to achieve that, considering that the limiting factor is how TV and movie content is licensed across the world. It seems highly unlikely that the situation is going to change anytime soon. Now You: Do you have a Netflix account? Are you impacted by the announcement? 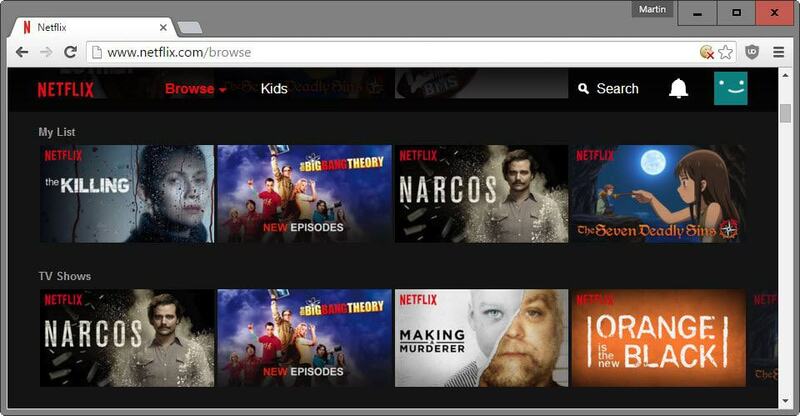 Netflix announced in January 2016 that it plans to block "unblocking" services such as VPNS or DNS proxy services. I don’t care about Netflix, but this policy is plain dumb, because the people using proxy servers or VPNs are actually paying for the content. And how long will it takes before some tech nerd is finding a solution for that blocking? I wait and see what happens, otherwise i probaly quit. It is highly unlikely that they will block the IP ranges of all VPN and DNS proxy services available globally. That’s what I’m thinking too. It would be rather difficult to accomplish. it will be fairly easy. if they block the top 50 paid VPN services, it should deal with 99% of VPN traffic. The others can not all be blocked, but they don’t have to. Most of those services are really slow, and will not be suitable for a good user experience. What an arrogant debility. Globalisation… Twenty-first century… A total disrespect for people. This is not a service, just another company trying to manipulate people. As a european staying at the other end of the world, I thought this would finally give me the possibility to view those great German and British tv programmes that I used to love when still staying in Europe. Many thanks Martin for letting us know. I was pondering to try it out, but information like this is more than enough to save my energy. With such a mentality it will never come into my house. We already have hundreds of tv channels here but not one european channel, nothing but blatantly infantile junk, and this way this thing is guaranteed not to give any added value. If you mean “the company” by the word company you’re correct. Don’t forget they also have to follow some laws and regulations themselves. It’s not about georestrictions – it’s about targeting and i’m not talking about advertising. Netflix WANTS globalization, but the content holders a) are asshats who will milk regional licensing for as long as they can and b) have current deals in place, many for several years, with local cable/sky providers. In order to appease the content holders, Netflix are making a song and dance about geo-blocking/lock-in, but clearly state that its difficult (they won’t try *that* hard). Long term, as they are able to get new content, and as it comes off contract from rivals, they will bid, win some, and push for more globalization of releases, and the need for IP restrictions will end (if indeed they were ever really enforced). So push your anger at the bullshittery and asshattery and fuckwittery of the content producers,… not at Netflix. At the very least they are disruptors which is a good thing. It was the same story with DVDs and those “regions” they were trying to implement… but we all know how that turned out. On one hand, I do understand Netflix has to do something about this (at least on the outside) because they’re probably pressured into it by “content providers”; but I’m sure they’ll do whatever they can to ensure the content is gradually the same everywhere. It is their business, after all. Content providers really need to wake up and smell the coffee, geo-restrictions have no place in a world (the Internet) where borders have no meaning, attempting to force an old world view into a new world is only going to end badly. Well, I already stopped using Netflix because of old content or tv shows that are only partially there, but I did enjoy the USA content in my dutch country at the time. Seems I now will never ever resub again if I can only access my local content. Is there a VPN service which cannot be spotted as being a VPN? Is it only conceivable, feasible? This is related not only to Netfix but concerns the very VPNs : in fact at this time anyone using a VPN is spotted as such, correct? I’m not at all into these VoDs, TV series and so on. I don’t even take advantage of all the channels available on plain TV here. In fact I’m not fond of TV when it comes to these soap-operas and even less viewing them on a monitor, though transferable on a TV set, and less even having to pay for the availability of hundreds of channels when I’d do like many others that is I’d stick on a few favorites. Too much in quantity too little in quality, IMO of course. Not everyone that is using a VPN will get blocked. What will likely happen is that Netflix adds IP ranges of known VPN providers to a blocklist. Others won’t be blocked at all and there is no 100% way they can block every single IP address. It is a cat and mouse game. Well, it is possible. You can set up your own for instance, rent a server in a country, set it up, and use it exclusively. Requires technical expertise though and there is still a chance that it will get blocked. Thanks for the information, Martin. Therefor the parameter of using a VPN provider recognized as such is another factor to take into consideration when choosing one’s VPN. Depending on the software used for the VPN, it is possible to detect it using how they connect to the VPN. However, all Netflix has to do is lookup some companies that offer VPN services that will allow them to bypass the geo-restrictions, then look up their IP address ranges that they are assigned to and what other servers are registered to that company. Then of course, they could limit the number of different connections per show, per IP address and/or device name (which they could pull from normal requests). However, I doubt they’ll want to invest that much time and money into a separate system to check for that when Firewall rules can handle it more efficiently. Tho, when companies do this, it opens up a new business (and technology) for people who want to tackle the challenge and offer services to do it. Everybody is mad at Netflix but it isn’t their fault, licensing is a pain. If they don’t try to block “illegal” foreign viewers, they lose the shows. Its unfortunate. Finally someone says the correct words. And just to be honest: Setting up OpenVPN on a cheap VPS in country XYZ shouldn’t be that hard. Just for example. Just replace the recommendation with the host of your choice and be free. And apparently it has started already. This limiting of online content (TV or anything else) to specific countries may in the long term prove an untenable approach, both from a technical viewpoint and from a consumer acceptation viewpoint. The “new” Netflix approach of blacklisting and blocking the IP addresses of known VPN servers will of course work only in the very short term. VPN providers are already working on systems like using random local user PCs as rotating intermediate proxies. This will amount to using near-unlimited server pools, with continuously changing IP addresses. Technically, this will become a battle that I guess Netflix will not be able to win. In the meantime, I also feel that the whole present approach regarding the growing use of VPNs needs some more fundamental thinking. For there are other content providers that (stupidly, imho) are beginning to block the IP addresses of known VPN servers. Let me give you my personal example. In situations where I use my VPN service, this is not to evade geo-restrictions (for like commenter Tom Hawack above, I’m not interested in services such as Netflix). But still I use the VPN route: simply to ensure privacy and anonymity. This is by principle of immense value to me, and using a VPN to access websites will often help to curtail any site’s privacy-invading user profiling. According to the newspaper people, they installed their annoying VPN barrier because data-stealer bots tend to use anonymizing VPNs for large-scale copying (stealing) of copyrighted newspaper content. Never mind that 99% of VPN users are no bots or crooks at all, but just ordinary people like you and me – who now each are duped by a slew of ridiculous captcha barriers. I feel that in this case the real, underlying motive to block VPNs is a different, more dangerous one. Such websites actually want to minimize the number of any VPN connections in their user base, and to discourage all use of VPNs. Why? Because they do not like to be hindered by VPN privacy barriers when it comes to their own mining of personal user data. They just don’t want a bunch of users who are more anonymous, whose privacy is harder to breach. I expect that very soon, the growing popularity of VPNs will led to a full-fledged techno-war of content providers in general (who don’t want more anonymous, hard-to-profile users) against the steadily growing number of privacy-aware users and consumers. This war will be a bit like what is happening already with ad blockers today, but then on a much wider and much more fundamental and important scale. This internet battle to unfold in the next few years will be a truly interesting spectacle to watch. It will primarily be a kind of action-vs-reaction technologies race, but also more. Will we consumers be able to hold our own privacy-fortress against all the different battering rams employed by commercial invaders, who will keep pounding our walls? With a little smart sense, creativity and ever new technologies, I hope we may well be able to keep ourselves safe. In the meantime, my condolences to Netflix users: you are among the first victims in this war, so to speak. I don’t know about the future but one thing seems for sure : people nowadays are far less reactive than they were in the sixties or even in the seventies. Mentalities have evolved from revolutionary to conservative, idealism as well has moved towards genuine materialism. Some may evoke the sens of reality, others may refer to a planetary surrender. I don’t know but seems to me that if the digital age had risen fifty years ago users would have been far less manipulated than they are presently. Whatever, if ethics is, as some assume it is, a facet of intelligence then the world still has a way to reconsider its aims. And this is true on both sides, world companies as well as individuals, with crooks on both sides. Liberty imposes implicitly the battle between all opposites. Perhaps there is more than liberty alone in a quest of truth, and that, IMO, resolves to ethics, to wonder “what can I do to improve the system” rather than to continuously and systematically wonder on “what should they do”. I have experienced similar IP blocks when using a VPN. One example that really annoyed me was a rather large and well known medical insurance company. I actually contacted the webmaster to let them know that their anti-VPN policy made life difficult for a potential customer. Well, I received the most amusing response. A lady emailed me a 5 or 6 line definition of “virtual private networks” that she had copied from some website! She then wrote a few lines to tell me that she cannot understand why a home user would be behind a VPN, since according to her definition, VPNs are used solely by business people to log into corporate networks!!!! ^_^ How do I even respond to that? I give you this amusing example to make a point: I think the more people wake up and use VPNs to safeguard their privacy and anonymity, the more VPN users will be subjected to web blocking and other restrictions (e.g. throttling of VPN users by ISPs). I also expect the growing popularity of VPNs will attract big negative attention from the anti-freedom crowd in political circles. We are already seeing these people in some countries (namely USA and UK) try to mandate backdoors in encryption. This argument is going to get morphed – if it hasn’t been already – into an attack on VPNs as well. You will hear suggestions that VPNs should be forced to keep detailed user activity logs, and even suggestions that users should only be able to use VPNs located in their own country. This is all really about power. Anyway, maybe some of you nice people can cancel your VPN subscriptions tonight? Let me continue to fly under the corporate/government radar a bit longer! Netflix in times of Movie10k and such illegal platforms, please …. Illegal people will find a way, and of course this never prevent someone to capture the stream and upload it on the internet so it doesn’t matter if they block illegal users or not, they will anyway watch the content but only on other platforms. They now act globally so they may raise the pressure of exactly spoken things. So: “Ah, you don’t want to give it away globally? Too bad… then we won’t buy your license.”. This time will come. But until then, Netflix must grow bigger and get mightier than nowadays. I would assume they are getting pressured into doing this by the copyright cult. I mean we can’t have those pesky aussies seeing tv that we see at the same time for the same money now can we. I may be wrong but i would think netflix would want no vpn or geo blocking at all but we live in a time where the copywrong companies are losing their grips so they have lawyers waiting to pounce at every stupid opportunity. I pay £90 for my sport and media combined each month and i still cant watch things that are filmed in the uk (all football games). Yet in the USA they get to watch my team every week.Pisses me off. Geo blocking/restricting is stupid in this day and age and it just forces people into piracy who would, and often do, pay. Pretty stupid of Netflix. People who use VPN are most likely people who understand and could as easily use something like Kodi. Netflix is convenient and troublefree that is why people pay for it. If Netflix changes the equation and limits content, lower value, and make it inconvenient to access content then it will push people to use something like Kodi. Blame Hollywood and copyright holders for it. The pressure is coming from them and Netflix has to get things done. But I bet, this isn’t the final word. Wait until Netflix acts as mighty as Google for this branch and then they will beg Netflix to show their stuff – even if anyone globally can access is simultaneously. 1. Some paid travelers do deserve the right to continue streaming the content on the site, then netflix would receive complaints. 2. Potential concerns & issues about Copyright will also matter hugely. 1. Top VPN service providers would try their best to keep even gain customers. 2. That being said here, netflix is going to stop “unwelcome” visitors, even registered users who have been falsely “flagged” because of VPN.